I was jonesing for some cake today, but with Virginia fighting a cold and myself not wanting to get one, I figured it would be best to just leave it… unless, the cake was actually good for us. Add wet ingredients to the dry ingredients, briskly mix together until batter is smooth, but not overmixed. Pour batter into greased 9-inch round cake pan and bake for 30 minutes (or until toothpick comes out clean) in a 350º oven. (I actually used a 7-inch springform, but it was a little small for the amount of batter, and I had a difficult time getting the center done without drying out the sides–hey that’s what experimentation is all about, right?). Because I had a smaller, but taller cake, I cut it into three sections and spread some cooked-down blackberries (with a splash of lemon and 1/2 tsp. corn starch to thicken it) between the layers… and since we had a bit of cream in the fridge, it seemed like a touch of freshly whipped cream on top was appropriate. Perfect with an afternoon cup of tea. In the spinning department, I finished up another bump of superwash merino. I kettle dyed some top in several 3 oz. portions (I actually thought I had set aside several 4 oz. portions, but I blame that mistake on the vicodin I was taking at the time…). 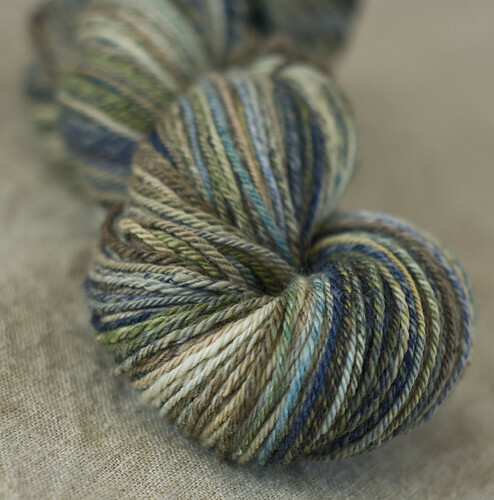 This skein is actually only 2.8 oz. but I was able to squeeze 220 yards of 3-ply yarn out of it. Probably not enough for a full pair of socks, but I’m spinning all this sock yarn a similar weight, so there will probably be some mixing and matching going on. Dan, glad to see the pairing of a bitter with a cake…well at least in the picture. Fred Eckhartd (83) the father of Northwest craft brewing is a strong advocate of sweets with stout beers…chocolate does particularly well. Pat and I enjoyed a coffee infused porter at “Fred Fest” his birthday party of 2007. A little porter…a taste of chocolate…some more porter…you get the idea…dark chocolate..milk chocolate. 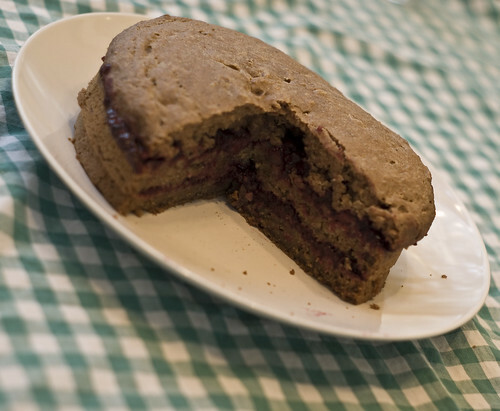 There is a barley wine out there that would go quite nicely with your cake. Pat and I will check your blog to keep tabs on you. Yes I find resonance with the quote from Annie Dillard. We get beat up in life…and some of it just does not resolve it self to tidy answers…instead the step to live the next day may be the best response. I’ve been ruminating on the nature of hope lately. There seems to be an optimism/hope that is built in to all of us..and just maybe hope is what gives us the strength to anticipate the next day even when the day just finished has been very tough. On the other hand I also think the same hope is what inspires us to linger on the really good days savoring them for all they are meant to be. I think that is the very compelling nature of your website…you and Virginia seem to take a deep delight in answering the deep call of creativity and craftmanship in your nature. I grew up with a father that was very much this way.